Why is it so easy to lie? Now, I’m going to get myself in trouble for this but I think one of the reasons that it is so easy to lie is that no one seems to want to call out the liar. I mean, there’s no upside because the liar is simply going to try and lie his way out. But I have a lifetime so far of tilting at windmills, adopting stray people and sticking my neck out for causes that I think are just. My husband spent the week of the 14th of April having his good knee replaced. Now he’s been waiting for time and technology to advance so that he can have his bad knee replaced and drive his Challenger 440 6-Pack. Well, now he’s old enough, 55 years and technology has advanced to a possible 30 year lifetime for a prosthetic knee so he’s not too worried about wearing out the prosthetic and he’s gone ahead and had it installed. 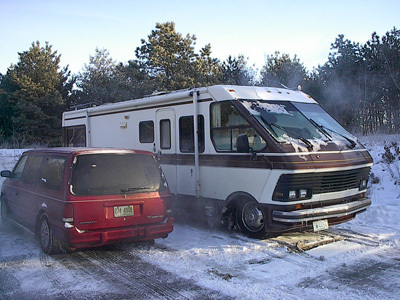 Unfortunately it’s not his bad knee but the good knee that wore out and his 70 Challenger is missing, stolen from him by Paul Doolittle, Sun Point Farm, Derry, NH.We live in a motor home, a derelict 32 foot Rockwood. Our full time home, a slowly coming back to life 32' 1987 Rockwood. Our life now consists of one night here, and one night there. Now that the snow is gone and temperatures are above freezing our dingy is my 1986 Honda Magna motorcycle. The Rockwood costs about $1.00/mile to move and the motorcycle 1/10 that or 10¢/mile. Going into the total joint replacement we tried to prepare for everything and one of the things we checked out was if we could stay in the hospitals parking lot. We had interactions with Elliot security no less than three times and the answer each time was yes. We notified Elliot Hospital security that we were coming for the operation and one of the Men in Black met us in parking lot 14 to check out what we planned to do. We had scouted the parking lot and found one spot where we could park the RV in one parking space and Elliot security suggested that I park the bike in the adjacent parking space. So we did and on the 10th Lynn had his surgery. 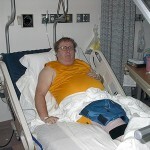 My partner resting on the second day after total joint replacement surgery. On Thursday the 12th, I had breakfast with Lynn and outlined my plan for the day and went back to the RV to pack some eBay stuff. While loading my motorcycle with eBay stuff that had to go to the post office what do I find but a hospital parking lot citation. I was flabbergasted but I went in and showed it to Lynn and we talked about a course of action. I called the number on the bottom of the ticket and was told that security had been out to talk to me about a complaint. It seems that someone inside the RV made a catcall to a female in the parking lot. Now I’m a 55 year old gay mail happily married and my husband has just undergone major surgery. I barely acknowledge women must less leer at them So this doesn’t pass the sniff test. I ask for the name of the woman and I’m told that it’s none of my business. I ask for the name of this guys superior and he tells me that he’ll call his boss for me. Men in Black indeed. Jeebus guy, you’re a rent a cop patrolling a parking lot. So I run my errands and near the end this wannbee cop but a full fledged bully calls me and tell me that I can’t have my motorcycle parked in the lot because it’s leaking oil. 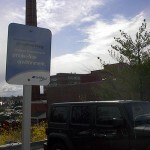 Funny, on the paper is says parked in a no parking zone. Make up your mind guy. Now Lynn likes diplomatic solutions but I got a guy that isn’t even granting me the courtesy of a believable lie, Lynn’s not dong well in recovery so I let him try his way first. Talk to the nurse. Talk to the social worker. Social worker talks to security and arranges a meeting. Meeting comes. Man in Black isn’t lying,he’s just telling me information I didn’t know. Man in Black still doesn’t know the mystery woman’s name but he does know that we can’t have the RV in the parking lot and its got to be gone by the end of visiting hours. This just gets better and better. A carefully arranged, fully above-board plan changed after I’m fully committed. 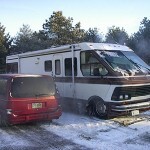 To top it off, there’s a parking ticket on the RV when I’m getting ready to run around in my $1/mile ride. This is where this whole Kafkaesque comedy becomes pitiful. 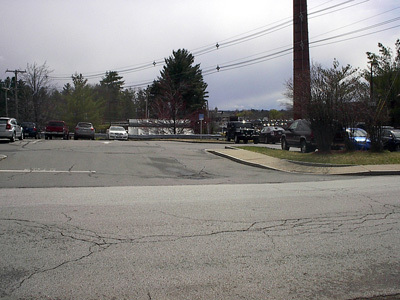 This is the entrance from auburn Street to Elliot Hospital’s parking lot 14. Now if you want to be a bully and harass the gay guys you really should be smart enough not to put it in writing cause there’s no signage saying that parking lot 14 is for employees only. 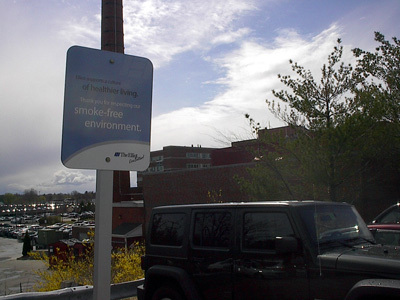 Sign saying that the Elliot Hospital Campus is a No Smoking Campus. I’m surprised the Elliot hospital has a policy forbidding people with relatives undergoing surgery from staying in a self contained RV on the hospital property. I’m astounded that after agreeing to a stay the hospital used this chain of unbelievable lies to encourage me to move and in addition made it almost impossible for me to visit my husband in the recovery ward. You would think that a big for-profit hospital would … I just don’t have words right now. 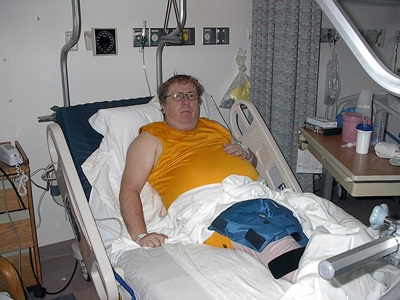 Lynn’s new knee is paid for by the Manchester Community Health Center and Elliot Charitable Care. 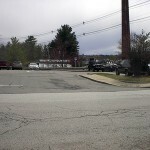 Maybe if we had rolled up in a 2007 Holiday Rambler and paid cash on the barrel-head we would have been allowed to park in the parking lot during Lynn’s stay and not been given the bum’s rush. 55 years old. By training, ability and experience I am a master toolmaker. My most recent projects include designing and building a process to grind a G rotor pump shaft with four diameters and holding all four diameters within plus or minus 4 microns of nominal. This was an automated process using two centerless grinders refitted to my specifications using automatic load and unload machines plus automatic feedback gauging. I also designed and built an inspection machine to check for the presence and size of a straight knurl on a hinge pin using a vision system for non-contact gauging. This entry was posted in Elliot Hospital. Bookmark the permalink. One Response to Why is it so easy to lie? Lynn Shackelford’s Stolen 1970 Dodge Challenger has Surfaced! Things that happen. Rolling blog posts in reverse chronological order.